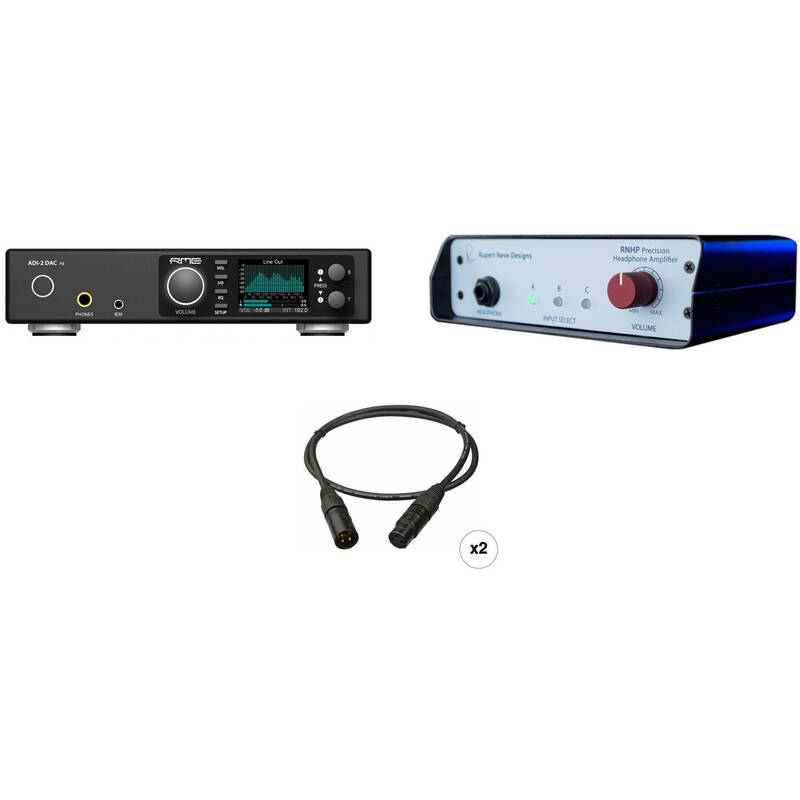 This B&H Kit includes the RME ADI-2 DAC high-resolution USB DAC with a remote control, the Rupert Neve Designs RNHP Precision Headphone Amplifier, and two Mogami Gold Studio XLR Female to XLR Male 3-pin XLR cables. Ideal for personal listening, mixing, and mastering, it supports sample rates up to 768 kHz, headphones up to 600 Ohms, and a variety of digital and analog connections. Built-in adjustable DSP allows customization of loudness, equalization, crossfeed, width, and more for a fully optimized aural experience. The RNHP Precision Headphone Amplifier from Rupert Neve Designs is a dedicated 24V reference-quality headphone amplifier that has a specifically-calibrated +4 dBu balanced line input, an unbalanced RCA input, and a 1/8" stereo mini-jack input, housed in a rugged VESA-mountable steel chassis. The headphone amplifier is based on the output circuit in the popular 5060 Centerpiece Desktop Mixer and has wide-open sonic performance with the ability to drive any pair of headphones up to 600 Ohms. The RNHP allows you to perform, mix, and enjoy your music with a new level of clarity. The 24V power supply is also included. The black, 3' Mogami Gold Studio XLR Female to XLR Male Microphone Cable is a high-quality, 4-conductor cable engineered for maximum rejection of RFI and EMI, accurate signal transmission with low noise, and durability. It uses the company's Neglex twisted, double-conductor quad cable with a spiral, bare copper shield, which is effective in maintaining signal integrity, even when used with unbalanced equipment, in professional or home studios suffering from wiring and grounding problems. The cable is terminated with black-body, gold-plated XLR connectors, and features a 0.236" diameter jacket, ideal for applications where a small-diameter quad mic cable is required. Box Dimensions (LxWxH) 13.6 x 8.6 x 3.3"
Box Dimensions (LxWxH) 13.2 x 6.7 x 3.4"
Box Dimensions (LxWxH) 9.5 x 8.0 x 1.0"